a Papua-man from Niugini "playing Jew's harp" on a living, buzzing sago-beetle (see photo above). ...Phons Bakx and friends are having fun, and there is much experimentation with the tonal sounds of the [Jew's] harp.... You're amazed at what sounds can be produced by this small instrument....This album shows his love for experimenting with Jew's harpsounds... Even non-players will get a buzz from this album. Where on Bakx' first CD the Jew's harp was combined with other instruments, here in 10 of the 18 tracks the Jew's harp is presented in duet-form, moreover the most free of traditional lines. Bakx performed 2 duets with the well-known Jew's harp player John Wright from Paris; 1 with André Houwing (percussion by Izz van Elk); 1 with Peter Kersten; and 6 with Enno Meijers with whom Bakx has formed a durable Jew's harp-duo for many years. The latter duo chose experimental ways for their intervals between Jew's harps. On this CD there is traditional music, and music on traditional instruments for another 6 tracks, all combined with Jew's harps: we'll hear 2 Irish (quick & slow) dances by Jules Bitter and Robert Bitter; 2 Sardinian folksongs by the legendary Middelburgs Jew's harp Ensemble from Bakx his hometown; 1 Afro-American 'old blues'-song by Banty Rooster from Utrecht; and 1 performance on Indonesian instruments by the group Genggénggonggan, at present known as Orang Génggong. There remains 2 oddities in this CD-part: track 17 is the remembrance of Bakx' Jew's harp-pupil Koen Kuijpers, who died in the spring of 1998. He plays solo on Jew's harp on stage in Rotterdam. 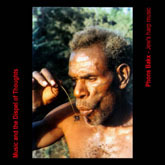 Track 18 is unique and rare: Mahisu, a Papua-man from Niugini "plays Jew's harp" on a living, buzzing beetle (see photo on very top of this page). ...Bakx is a master of the Jew's harp, and provides copious information about each of the songs he presents. The music he has selected spans many years, cultures and countries, with the Jew's harp as its constant. Bakx's careful documentation and painstaking playing makes this cd that most elusive of creatures, an accessible labor of academic love. After a few hours with this disc, I not only had an increased respect for the versatility of the Jew's harp - I also wanted to go to the music shop and get one. Good rock & roll has sold guitars for years, so why shouldn't the cd ''Music and the Dispel of Thoughts" sell a few Jew's harps?...For anyone fascinated by the nature of sound and its significance within cultural and sociological contexts, I recommend this disc most highly. In Part II we meet Bakx' initiation days as a Jew's harp player (1986-1987) mingled with short soundcuts, e.g. the worknoises of Jew's harp makers from Norway and Austria, et cetera. Main feature of his Jew's harp Mosaics (his own compositions) is the use of a multiple recording-system, which made possible that Phons Bakx dubbed his Jew's harp playing 4 or 5 times. With his 'Jew's harp Mosaics' he convinced in his initial days many a person that Jew's harps were not longer trifling knick-knacks, but musical instruments that could produce minute sounds of elegance. In 'Jew's harp Mosaics # 3' Bakx played on a reconstructed, Jew's harp-like mouth instrument (utété) of grassy wood, of which the obsolete originals for the last time were in popular use at the Îles Marquises (Polynesia) at the end of the nineteenth century. Its sound evokes a kind of musique concrète : the spheres of a grass-like micro-cosmos inhabited by chirping insects. In the 'Jew's harp Mosaics' restlessness, chaos, but also space, contemplation and reveries are undoubtedly expressed in a dynamic way. It is minimal music: they all seem to be constructed by slowly changing patterns that rise into an adequate kind of music. Notwithstanding the Jew's harp as a folk-musical instrument, this music will sometimes more be appreciated as rock-music than as folk-music. This all makes the 'Jew's harp Mosaics' unequalled, and we may ask ourselves if such compositions for the Jew's harp were made and recorded on tape ever before.